A big part of Content Creation is adding value so that your audience learns something, wants to know more, and gravitates towards you and your services. I totally get it. But, content isn’t just for selling. People don’t want to consume sales pitches and promotions, especially at first. They want to consume something informative and entertaining which leads them to the sales stuff. So, it’s your job to create something that will interest your customers, creates value without being overly promotional. I’ve seen these tips work wonders for me! To create better content, you must know a few things about your audience. What do they want? What do they fear? How can you bring solutions to their problems? Talk about a pain point your clients are having (I’m doing it right now). How much more interested are you to figure out how to create better content? Now, how interested would you be if instead I said “Buy my book on creating content to learn my content tips!” You’d most likely be less interested. One thing I notice a lot of people fear is giving away too much information (I used to, as well!) You’re probably thinking,”If everyone knows my secrets, they won’t want to buy from me!” But, the truth is, you most likely won’t give away all your secrets through content. And if you do, your followers are just going to want to follow you more, so they can learn. Making them more likely to buy. If you have a new course or guide, give your audience that content! If it’s good information or entertains them, they will want more! Don’t worry about sharing too much. If you’re an expert, there is always more to share and your customers will look to you to find it. As an entrepreneur, every piece of content you create doesn’t have to paint a pretty picture. Let your followers know that you are a real person, you make mistakes, and you’re still learning. Share an experience or story that people can relate with. Content is all about sharing stories. Talk about your successes or failures within your topic. People love a good story. You’ll be surprised at how many people want to know more about you just when you share who you are. We are all in the business to make money. Your customer is bombarded every day with sales pitches, ads, and content. Do you want your content to be lost in a sea of ads? No, you want to be there for your customer! Be the person who educates them and gives them knowledge, when all they see is pitching. When you’re creating content, think about how you can serve your clients, not how you can get them to buy your stuff. Think of yourself as an artist who paints to share their love with the world. Not to sell it to the highest bidder. Creating valuable content can be tough. I see many of my clients and followers struggle to really share their value with the world. Which is why I’ve created the free 10 Day Content Creation Challenge! The challenge, which takes place on November 27th, 2017, is going to help you create quality content over the course of 10 days. When you sign up, you get a video training each day posted here in the group, a chance to get inspiration and feedback from other women entrepreneurs, and a live Q&A with me each day! The types of content we’ll be covering are text, image, and video content: Text – Value posts, Ladder Posts, Blogs, Image – Branded Photo, Non-Branded Photo, Graphic, Video – Stories, Pre-Recorded Video, and Live Video. On the last day, we will create a vlog that incorporates all three content types. How awesome is all this?!? Oh, and I’m not even done. 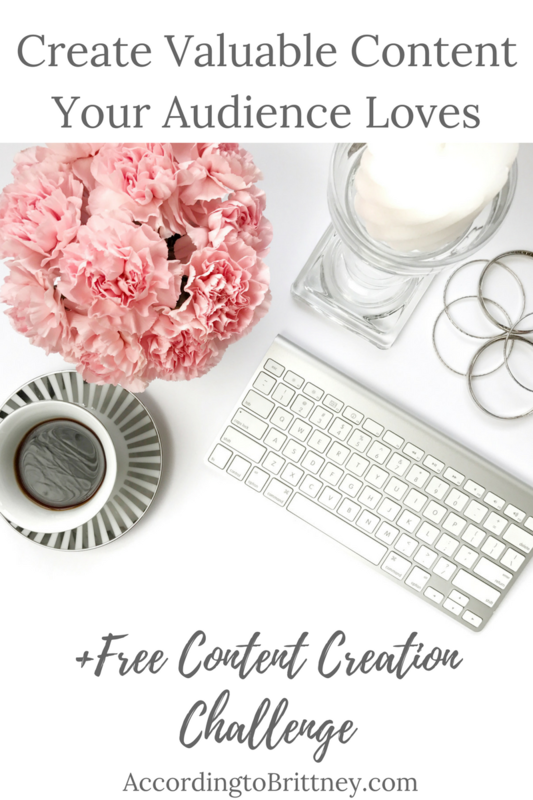 When you sign up, you get my simple content calendar template for free! This simple content calendar lets you plan your content for a full month! It’s easy to use and completely customizeable to fit all your content needs without overthinking it! I know that this all sounds great. But, I’m still not finished. I have a little something extra for those who want to roll into the challenge in style. 10 Day Content Creation Workbook that includes all written trainings, brainstorming sections, and content examples! A group coaching call with yours truly to discuss social media, content creation, and building a social media presence. You can get your hands on this upgrade for only $38 $18 until November 12th at 11:59pm EST. After this, it goes up 20 bucks! So, I would definitely advise grabbing it now. This challenge is exactly what you need to help consistently create content, build a thriving social media presence, and create desire in your products and services.